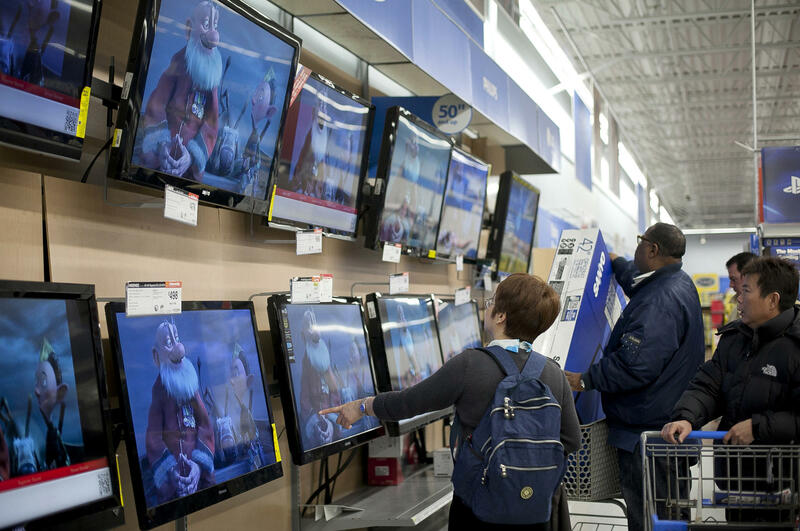 Shoppers look at televisions at a Walmart during Black Friday sales in 2012 in Quincy, Mass. Walmart has been testing a partnership with Handy in Atlanta and now plans to expand it to more than 2,000 locations. The idea is to appeal to shoppers with more convenience — a major battlefield for retailers. Amazon is expanding its own home-services offerings, such as dog walkers and plumbers. Ikea, the giant furniture retailer, recently purchased TaskRabbit, another marketplace for freelance professionals, including people who can help you assemble furniture. "There's a lot happening in products and services being bundled together. ... I think it's a meaningful priority for retailers to figure this out," says Oisin Hanrahan, co-founder and CEO of Handy. His company started as a website and an app that link customers with people who provide cleaning, plumbing, handyman and other services. Lately, this kind of convenience factor has started attracting retailers, eager to compete for the best experience of shopping — beyond the choice and price, but also speed of delivery, overall ease and special perks. For its part, Amazon has been focusing heavily on expanding its reach further into people's homes. Following the big success of its smart home speaker Alexa, Amazon recently bought Ring, a maker of Internet-connected doorbells that can stream video to the owner's smartphone. This followed a launch of a service called Key — Internet-connected locks and security cameras that allow delivery couriers to drop packages inside people's homes. For Handy, a partnership with Walmart will represent the first time the app gets a footprint in a physical store, according to Hanrahan. The company already has a partnership with Wayfair, the online furniture and home goods retailer. "Obviously there's a huge shift of people buying more and more product online, but still the vast majority of product is still sold in-store, and particularly heavy bulky product," Hanrahan says. He says Walmart shoppers will be offered TV installation for $79 and furniture assembly for $59 through the Handy app or website. Major retailers are trying to figure out ways to appeal to customers beyond just selling them products. Nordstrom has a store that doesn't stock any clothes but has a place to relax with wine and espresso or a manicure. Amazon is offering the services of plumbers and dog walkers. And now Walmart has linked up with a home service that's like having staff on call. NPR's Alina Selyukh reports on the retailer's latest move. ALINA SELYUKH, BYLINE: Walmart has been trying a lot of things lately - same-day delivery, groceries dropped directly into your fridge, even a personal shopping service. This is Walmart trying to defend its No. 1 retailer spot from Amazon. One of the biggest battles is convenience. Enter the man who knows all about it. OISIN HANRAHAN: I'm Oisin Hanrahan. I'm the co-founder and CEO of Handy. SELYUKH: Handy is an app and a website where you can book home services. HANRAHAN: From handypeople to cleaners, to electricians, carpenters. SELYUKH: This kind of professional help is always in demand, sometimes for unexpected reasons. HANRAHAN: We had a funny one recently where - a child that had clearly gotten their parents' log in and asked a handyperson to come along, but had put in the comments that they don't need any tools, but they wanted an essay written. SELYUKH: OK, homework is not part of the offer. But what appealed to Walmart was furniture assembly and TV mounting services. So now people who buy furniture and TVs at more than 2,000 Walmart stores may get a deal from Handy to assemble or install their new purchases. This kind of service is already offered by online retailer Wayfair, and of course Best Buy is well-known for its Geek Squad. And Ikea recently bought TaskRabbit, the massive marketplace for various professional services, including people who will assemble furniture for a fee. Alina Selyukh, NPR News. (SOUNDBITE OF PETE ROCK'S "A LITTLE SOUL") Transcript provided by NPR, Copyright NPR.